Go Lily Robert Foley, ARTIST! This is from an exhibition of Lily’s work at la espacia, viewable each evening from the sidewalk on 17th St, between Laflin & Loomis. I’ve decided to post snippets of this essay, which appropriates chunks of other thinkers’ ideas, in three installments on this dear blog; remember kids, Green Lantern was once an Apartment Gallery! The democratic forum for free opinion in postwar America expanded to discussions amongst citizens—of art objects that didn’t do anything, and weren’t worth anything, but which were perceived to embody values they held dear enough to argue about and invest in. This led to what art critic Dave Hickey termed the “Secular Reformation—a return of the Word at the expense of the flesh and a new jihad against idolaters, now guilty of ‘commodification.’” That is to say, this birthed the modern art world (the social system centered around artistic production and commerce). Institutions such as The Museum of Modern Art in New York and The Art Institute of Chicago held power in the art world, and promoted tenets on behalf of an ongoing “critique of representation.” As Hickey observes, This drove contemporary art to functioning much like religious art had in the past—promoting social divisions, official policy, and commerce. Apartment galleries and a plethora of independent art spaces, which now thrive in Chicago, seek to demonstrate against standards of the art world and advocate their own vision of power and beauty; they rose from the alternative discourse of embodied dissent. Yet, though apartment galleries exist under the rubric of alternative culture, they can still reinforce socioeconomic divisions and reinstitute art world hegemonies: they often perform insularity similar to that which takes place within the art world. In fact, alternative art spaces often feed into the practices of the very institutions that these spaces initially functioned to criticize—such is the paradox of alternative discourses. An apartment gallery is a residential apartment that includes an art gallery, with boundaries that are defined by the resident/gallerist. Artists often start these spaces seeking sustainable modes for displaying their work. Apartment galleries are often in violation of legal codes and other official statutes. They are transient, vulnerable to the limits of leases and increases in rent. Their presence is an act of assertion over a space in which one has very little real control but very much perceived agency. These are a collective enterprise —a fluctuating network of complex relationships amongst art spaces and negotiations between the tangible dichotomies of artist/community, private/public, alternative/mainstream, and art/domesticity. Apartment galleries provide alternative models for artistic success, insofar as the most common measure of success within the art world is indoctrination into the cultural institution. The art institution gives value and meaning to a given artwork, since artworks are created through the subjective experience of the artist. Without the aura of importance bestowed upon an artwork by the institution, the greater public would be unaware of the work’s significance. Thus the institution provides an external, authoritative mechanism to substantiate an artwork’s contribution via the general public’s realization of the objective value of an artwork within the larger cultural market. Cultural institutions perform a distancing act of sorts between social classes despite their pretense of democratic universalism, by stating their positions regarding what art is and how it is to be viewed. The institutional model for viewing artwork (currently concordant with Kantian aesthetic theory—whereby a certain level of cultural competence is required for the proper experience of art) implies the notion that the less educated—typically those of a lower class—lack the academic qualifications and exposure to aesthetic experiences requisite for properly experiencing art. The art expert gains cultural capital , through his/her reliance on the institution of art-historical training as the necessary means of gaining the tools for appreciating works of art. This can be seen as a way by which class inequalities are perpetrated and perpetuated. Artistic experience functions differently in apartment galleries. By introducing aesthetic ideas to their neighborhood, they can potentially incite a cultural dialogue with members of their local community. The presence of an apartment gallery within a residential neighborhood is inherently political; the resident has adopted a position of social agency within a community during a time of increasing widespread isolationism. Due to the apartment gallery’s close proximity to one’s home, art is introduced into the practice of one’s everyday life. This can cause one to feel any number of different emotions and thoughts. Be it pride, wonder, antagonism or intrusion, such reactions exemplify art’s social agency. However, the full social potential of an apartment gallery depends on the apartment gallerist and how he/she engages the local community. In the case of my apartment gallery, la espacia, the neighborhood is vital to the praxis of the gallery’s inception. 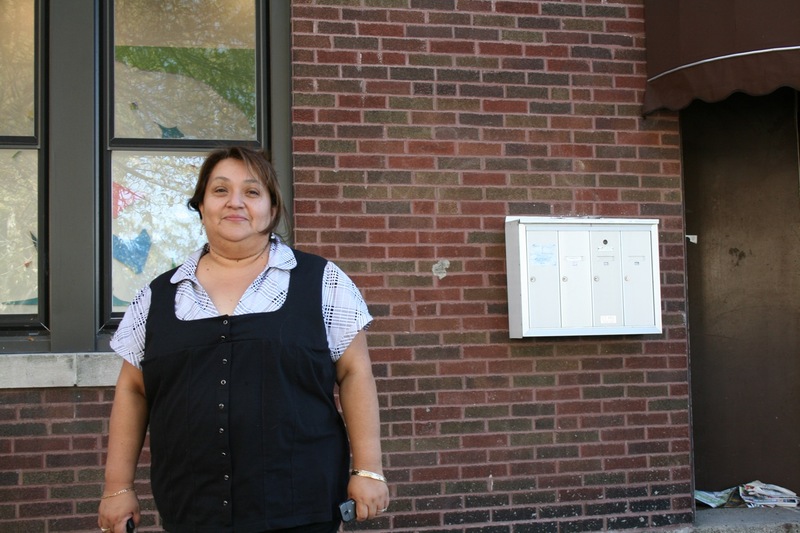 la espacia is located in a street-level apartment of a 2-flat in the Pilsen neighborhood of Chicago, a community predominantly inhabited by working-class Mexican families that made their homes here generations prior to my settling in it. My entrance into the neighborhood, along with that of the growing number of art students who live in surrounding blocks, and the emergence of an artists’ book store in an old storefront about a block away, are indicative of the gentrification that has begun in the neighborhood. 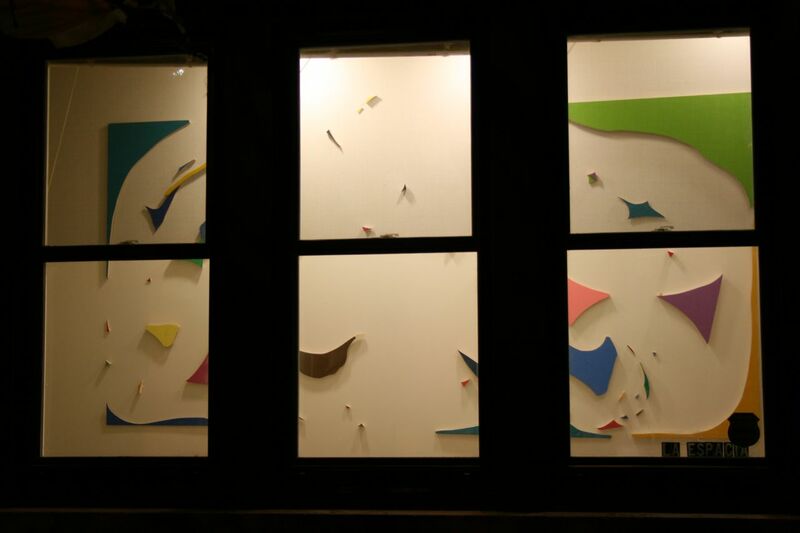 I chose the three double-pane windows that face the sidewalk as the main mode of reception for art exhibitions because I felt that was the way I could reach the largest and most diverse audience. 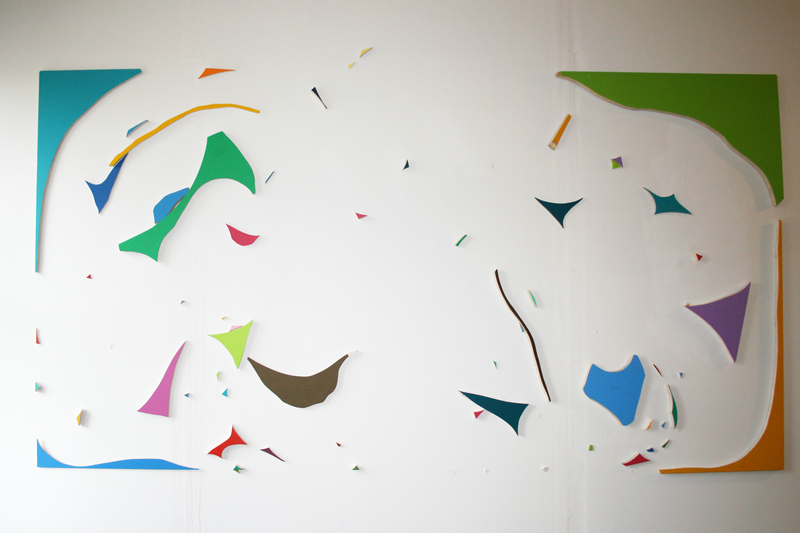 I hang artwork on a wall on casters, which I built. During the day, the wall is kept to one side of the dining room to let light in. At night the wall is rolled against the window and front lit so that the public can view it. I conceived this as a sort of site-specific installation wherein conventions of public commercial displays (store window displays, billboards), along with administrative, preparatory, and curatorial practices, became essential elements of this project, and by extension, my artistic practice: the apartment gallery as art studio. What are the implications of an apartment gallery that is open to the public, but essentially serves the gallerist, him/herself? Do apartment galleries merely cultivate the personal status, lifestyle and the acquisition of social and cultural capital by the gallerist and artist? The apartment gallerist explores these and other issues through real-time lived-in experience. I am so happy and hopeful! Meet Bunk, he’s la espacia’s resident sweetheart. 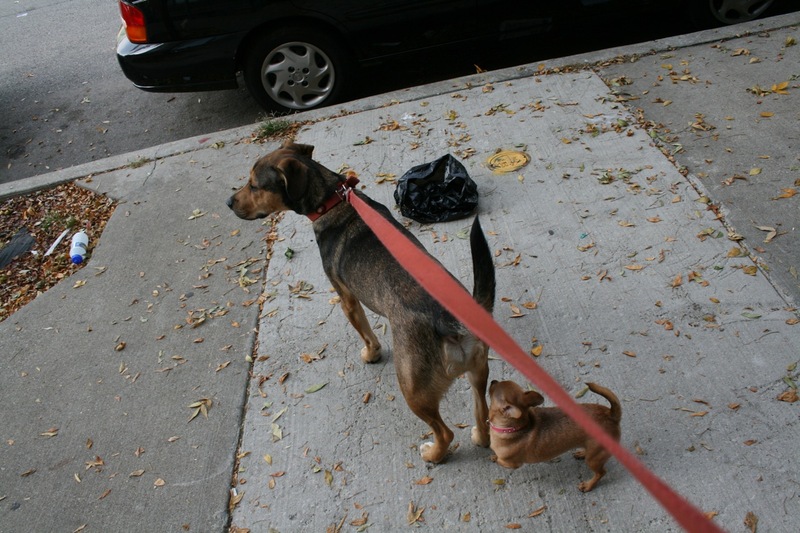 The little hussy chihuahua trying to sniff on his booty is J. Lo…seriously. Many of you may have probably been following the recent efforts in Congress to stimulate the economy and bail us out of our recent economic problems. A connection between a small detail of these efforts and a recent thread of conversation on The Green Lantern blog occurred to me the other night while listening to the news, waiting for my sleeping medication to kick in. As many of you know, one feature of a proposed new spending plan includes what some in Hollywood—I mean, Washington—call, “golden parachutes”. This means, to the best of my understanding, that in order to assess responsibility and provide incentive to corporate big-wigs who have swindled the American public and fucked the economy, the bill plans to reserve some of its funding to pay off big bad CEO’s and the likes as they are punished. To me and probably most of the people reading this blog, this seems almost painfully absurd. However, when questioned about the merit of this plan, Republicans and those in support of these “golden parachutes” replied that the big pay-offs are necessary as incentives to the landed gentry to comply with regulations and policies that will help those who actually need help. You can blame the drugs, the bad posture, the genetic history of mental illness—but as the synapses were misfiring in my brain, I was reminded upon hearing this, of the reasoning behind curtailing educational benefits for veterans returning for Iraq. The implication was that if the government offers too many goodies for veterans as they return home, where’s the incentive to stay in Iraq? And the synapses, like a band of blind people playing laser tag, led me to contemplate even further a field to the general notion the Right in this country holds that if we provide too much help for those in need, they will act like leeches on society and won’t be inspired by their poverty to work hard and support their economy with their back breaking labor and mystifying ingenuity. Over the past week or so there has been an on-going conversation on The Green Lantern Blog about the nature of subjectivity. Perhaps I am the only one who has identified this conversation as existing and as being on this subject. But I believe it is there. It involves the location of the audience in writing (1), the practice of keeping secrets (2), and America’s obsession with packaging (3). Here is a writer, sitting at her desk. She is writing for someone. In this case, any and all possible readers of The Green Lantern blog. Last night, however, she wrote for an old lover whom she doesn’t know anymore and has nearly forgotten. This morning she wrote for someone she does not know, and all last year she wrote for no one: for truth, maybe or for knowledge or for history. Possibly: to un-write that which was written before. Or maybe for herself, as she watches herself, and as the writing appears on the screen she becomes her own audience. But she is certain that somehow she writes for someone, because she has a desire for this someone—an unnamed specter or spectator—to understand what she is writing. Therefore she writes for an ear or a set of eyes. Her motivation to write—although it emerges from the wet, dark labyrinth of the self—is located in another. D) that it will support my weight and will enable me to complete my ascent or descent of the stairway. And what if I am wrong? Packaging serves a number of purposes. Ostensibly, it keeps the interior clean, sanitary and protected from the horrors of the world outside the package (of which there are many). In our society it also identifies the product for us. A loaf of bread is a loaf of bread is a loaf of bread. But an Iron Kid’s Bread is not a Wonder Bread is not a Tastemaster Buns. The inside becomes somehow defined by this exterior. The relationship between what is presented to the public and what substantiates a hidden interior is complex. Perhaps the American obsession with packaging can somehow be made analogous to an American obsession with defining reality, with making it durable, reliable and safe: to process and condense the rent between the self and the other, from where the anxiety of representation is born. If I could only package my lover. If I could be certain that what he shows me and tells me is a true representation of the secret world that hides behind his face, and of the moments of his absence when he thinks and does things I cannot witness. But I cannot, so I am forced to either trust him or to become insane—to question the reality that is most possible for me to believe. Eventually I realize I cannot know his reality and he cannot determine mine. In the end, we share reality. It is partly what I believe and partly what he believes, and also, partly what I believe he believes and what he believes I believe, and partly, what I believe he believes I believe and what he believes I believe he believes, and what they believe. I’ll let you be in my dream if I can be in yours. I think Bob Dylan said that. Lastly, I will attempt to relate the first part of my essay to the second to a new art space in Pilsen called, La Espacia (1437 W. 17th Street). The exterior of a house is its packaging. It looks like a face. Inside, someone else’s reality is unfolding, away from you, in private, in secret. In between the street and the house is a window. That is where those who are inside can see what is outside and where those who are outside can see what is inside. That is where we find language, and other ways of sharing our realities, and in the process, inventing them. La Espacia is a single wall that has been built on casters. During the day, the wall is kept inside the house on the right hand side of the dining room to let light in (to let the world into the house). At night the wall is rolled against the window and front lit so that the public can view it. In the liminal space between public and private, there is a window and in that window there is art. At the beginning of the essay I cited several examples of reasoning from Right Wing ideology in this country. Each of these examples locates the power to act in the individual. The individual solely is responsible for his own economic well-being, and the only course of action for the government is to provide incentive to individuals to act upon this agency. It bears repeating that in every instance this incentive is based on the desire to make money. This ideology is built off of a uni-directional model of subjectivity. The subject desires, and based on a chaotic collision of these desires, society, economy and community are supposedly created. The desiring subject alone has the capacity to decide what reality is and what is possible within its bounds. This logic provides no space for the interaction of subjects, for the collective imagining of society that does not happen in the eyes and in between the ears of one person, but in the space between two or more subjects in communication. I hope that the thread that I have reiterated in the second section of this essay connecting the space of the audience in writing, the practice of keeping secrets, and the American obsession with packaging has shown that reality and society are indeed collective. That reality is not the lone impulse of one individual’s desire, but the negotiation of different view points. That reality is a movable wall rolled on casters between a dining room wall and a window facing the street. It’s that model of reality that makes La Espacia, love, and The Green Lantern possible. Really, you should be excited about Wednesdays on this here blog, ’cause startin’ today, we’re going to post image(s) of artwork from current art exhibitions taking place in Chicago…EVERY WEDNESDAY! Since this was decided on a whim, I’m promoting myself. This week’s image is of an artwork up at La Espacia, in Pilsen (1437 w 17th St). The exhibition opened up last week, open for viewing nightly. It’s made of found materials, wood, and oil paints.